An Extended Body Sprinter Van that's 22' long. Perfect for long distance traveling and full time camping. 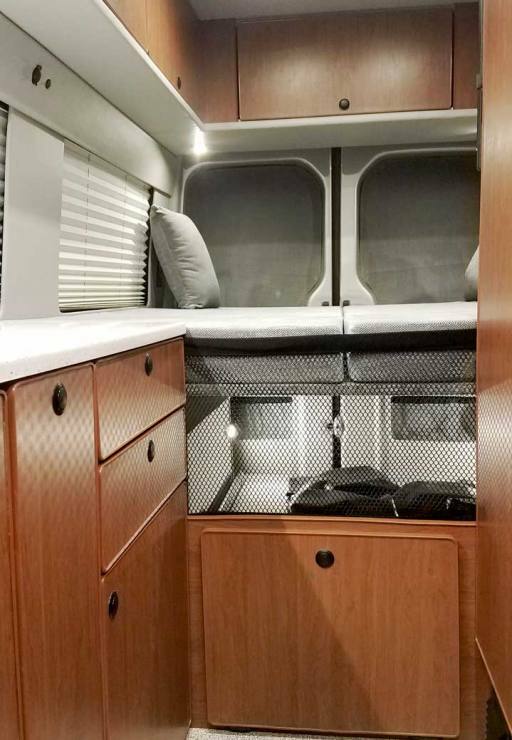 Entry cabinet is accessible from the outside or inside the van. For spaciousness all the cabinets are low except the refrigerator and closet tall cabinets. This is a low bath cabinet with a toilet and shower. It’s compact and works well. Cabinet top easily swings up. Curtain slides around for privacy and showering. Rear storage is also convenient from the inside van with a rear door. This platform bed measures 75″ x 69″. Two height adjustments. Rear window Arctic panels in place. Removable. Heavy duty slide out tray (o) shown. 72″ x 50″. 30 Gallon fresh water tank and inverter are in passenger side compartment.